Husky sledding experiences aren’t just for the Arctic. If you’ve found this page, then you could be in line for the husky sledding experience of a lifetime – also known as “mushing” from the shout you make to urge them on. Learn how to handle the pack of willing, intelligent sled dogs, how to control them, how to work in harmony with them as you instructor teaches you the essential tips and tricks of “mushing”. 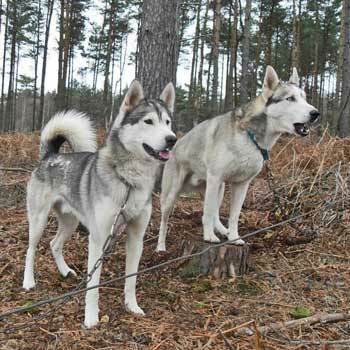 For some reason, husky experiences are seasonal (and it’s not the obvious reason, because you don’t need snow – but the dogs are born to handle cold weather and if worked too hard in the summer they can overheat!) and locations change from month to month throughout the year. This means the experience companies add and remove them quite a lot over the course of the year, and experiences will appear and then suddenly disappear in places as diverse as Gloucester, Dartford in Kent, and Aviemore in Scotland, as well as others. Check out the full range below to see if there’s one near you at the moment. What’s the cheapest husky experience? Compare prices and find the best buy here. Here’s a list of all the current husky experience days. with prices updated in real time so you know they’re the cheapest and you’re the first to see any offers. We update the list in real time to keep track of the changes, and make sure of the very latest husky experience locations and prices, so if it’s not on here, then you can’t buy it. What happens on husky experience days? First you get introduced to your huskies and shown how they work with demonstrations from the experts to give you the tips and tricks of dog sledding. These are fine dogs and very furry,good-looking animals, but they’re working dogs not pets, and their strength and agility will amaze you. But you’ll also be surprised at how quickly you get the hang of controlling the pack and getting them to go where and when you want them to. After all, they’re well trained, willing workers and are never happier than when pulling the sled. Then, when you’ve learnt dog-control, you’re on your own. It will be just you and the sled team, going through your paces on the sled track. Dog sled experiences are hard to come by in the UK, but we’ve scoured the net and found them all. Husky sled experiences for one, or take a friend and share a husky experience for two. Husky dog sledding experiences4.33333333333Sarah FirminHusky sledding experiences – the thrill and excitement of working in harmony with a pack of sled dogs. A true mushing experience. This is an animal experience with a difference – you don’t just look at and handle the animals but you work together with them just like a real musher in the frozen North.